The nasty cold can really ruin your appetite and make you feel miserable, but you need to stay well nourished and hydrated to fight infection. 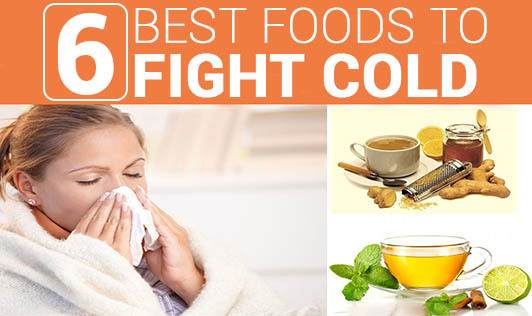 Here is a list of 6 best foods to eat when you have severe cold. 1. Hot clear soups- Hot homemade soups warm and relax your congested chest. The hot soup broth keeps the nasal passage moist; prevents dehydration and fights throat inflammation. For non vegetarians, soups made with chicken can do wonders as amino acid ‘cysteine' in chicken thins the mucus in the lungs and relieves congestion. 2. Honey- Honey has antimicrobial properties and can kill throat bacteria. Mixing a spoon of honey with warm water or tea will definitely give you relief from sore throat. 3. Ginger- The antiviral, antifungal and antitoxin properties of ginger helps you treat cold and cough effectively. Add chopped ginger pieces and tulsi in a glass of water and boil it till it reduces to half its quantity. Strain and have it hot with 1tsp of honey for instant relief from sore throat. 4. Gorge on Citrus fruits- Vitamin C and flavonoids rich citrus fruits boost your immune system and speed up recovery. 5. Hot green tea- Rich in antioxidants, hot green tea improves your immunity. It also soothes sore throat, alleviates congestion and keeps you hydrated. 6. Spicy foods- Spicy food helps to relieve congestion by loosening the mucus. Next time you have a cold, take plenty of rest and include some of these awesome foods in your diet for a speedy recovery.